not able to get any child support and furthermore, I had lost my job. a big downfall as no pets were allowed. I was a struggling single parent living on welfare at the time. But how could I deprive my three year old of the joys that that I had all my life? How could I deprive my young son the priviledge and enjoyment obtained from having animals? The first couple of years we did live animal free and I was very lonesome for a pet. I had had dogs all of my life and now for the first time, at the age of 25, I had none. it so be it. He agreed and we ended up coming home with not one kitten but tabby twins! the birth experience just like I had when I was a young girl. 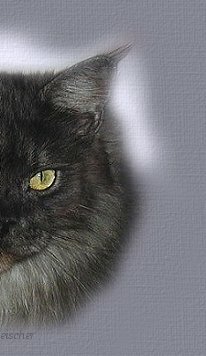 Chino, was a beautiful black and white long haired cat who looked like his grandmother, the black cat that Coreen owned. We had Fancy, the mother, and Chino, known as Chi Chi, the son. Fancy was a quiet cat but her son was very energetic. At the time that we named him, we did not know that chi is the chinese word for energy, and our cat was exactly that, chi chi; double the energy. 13 years old took it in stride, he knew that the day may come that this would happen. found her owner She was definately abandoned and we were going to keep her. How could I say no to my son! was retarded. But she was lovable nonetheless. with each of us while we slept. Though we couldn't hold her as she wouldn't let us, she was always in a room with one of us. but she would have none of it. When we moved to the new appartment two years ago, she was the only animal in the house and she became more affectionate than she had ever been. She now would lay in our laps and purr but still, it was very rare that she would let you hold her. not there to pay them. on the floor. There was blood from one end of the room to the other. Obviously Steven had not seen this or he would have told me immediately. I called to her and though she tried she could not lift her head. I panicked and my heart broke, I couldn't bare to see my poor beloved cat like this. The pain pierced my heart like a sword. be held nor did she like the outside. she could not tell how long she would live. She said she had no way of knowing if this was Tao's time to go. 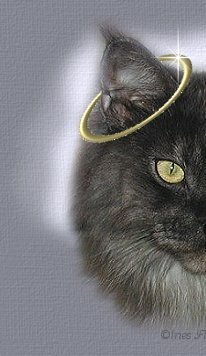 I then made the decision that my beloved cat be put to sleep. I could not bear to see her this way anymore. 47 year old woman crying over her beloved cat. Tao is finally in her resting place free from the trauma of this world. Please don't take from this site. The midi is Heaven's Heartbeat by ©Night Angel. It is used with permission. Visit Night Angel's wonderful site here.